Kidney stones are small crystallized structures that can form as a result of an imbalance of certain components in urine such as calcium, oxalate and phosphate. They can also be caused as a result of a urinary tract infection or hereditary factors. With more than a million cases diagnosed each year, kidney stones are among the most painful and most common disorder of the urinary system. It is estimated that 10 percent of Americans will acquire them during their lifetime. While many kidney stones pass without the need for medical intervention, when it is needed, El Camino Urology Medical Group is ready to provide compassionate state-of-the-art care for improved outcomes, enhanced patient comfort and rapid recovery. Routine x-rays taken during physical examinations can discover kidney stones in patients where no symptoms are evident. More frequently, kidney stones are found as a result of a diagnostic imaging examination (abdominal/pelvic CT scan) ordered for patients manifesting symptoms such as blood in the urine and/or sudden and intense back (flank) pain. Additionally, blood and urine tests are used to detect compounds or substances that suggest the presence of kidney stones and conditions that can promote their formation. This minimally invasive, non-surgical outpatient procedure focuses ultrasonic shock waves through a patient’s skin and tissue and onto the kidney stones. As the shock waves impact the stones, they break them into minute particles which can be easily passed through the urinary tract in the urine. This procedure requires no anesthesia and most patients resume normal activities in several days. Large kidney stones may require more than one lithotripsy treatment. This minimally invasive procedure is also used to treat stones in the ureters. Since it does not require an incision, it involves inserting a fiberoptic ureteroscope directly into the opening in the urethra, through the bladder and into the ureter. Through it, a physician can view the stone and pass instruments to remove or fragment it. This is a day surgery procedure that involves anesthesia and placement of a stent in the ureter while healing takes place. 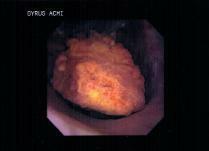 Ureteroscopy allows for precise visualization of kidney stones in any part of the urinary system. 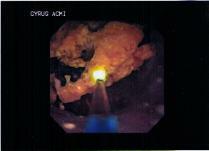 These consecutive images obtained during surgery show how the stone is shaved down to a smaller size with the laser energy delivered through the ureteroscope. After the stone has been adequately fragmented only small pieces remain that can easily pass out of the ureter without causing any pain or discomfort. Larger pieces can be manually removed using tiny “baskets” that also fit through the channel of the ureteroscope. The entire surgery is performed without any incisions or blood loss. This procedure permits surgery to be performed inside the kidney without making an external incision. It is an outpatient procedure where a viewing tube, called a fiberoptic endoscope, and instruments for performing the surgery are inserted through the opening in the urethra, and moved through the bladder and the ureter and into the kidney. The procedure is for children and patients in general with kidney stones, narrowing of the outlet of the kidney, urethral strictures (scarring) and kidney tumors, as well as patients with bleeding disorders or who are overweight. The procedure involves the use of local, intravenous or general anesthesia. This minimally invasive surgical procedure is for larger stones located in the ureters where externally administered lithotripsy cannot be used effectively or where the stones cause a blockage that cannot be bypassed by a stent. The ureters are anatomical structures descending from the kidney to the bladder. The procedure involves a small incision in the patient’s flank into which a nephroscope is inserted to locate and physically remove the stone. In certain situations larger stones may be broken into smaller pieces through the use of an energy probe (i.e. ultrasound) inserted through the incision. The entire procedure requires sedation or anesthesia and a short hospital stay. The comprehensive level of care provided by the El Camino Urology Medical Group includes helping patients manage their disease and prevent recurrence. Once your stone has been treated or has passed spontaneously, we will analyze the stone and your urine using a simple at home 24 hour urine collection to determine why you are making kidney stones. Based on the results, the physicians at El Camino Urology Group will offer a customized treatment plan that could include simple dietary changes, increasing fluid intake, and medications. We believe in the saying, “an ounce of prevention is worth a pound of cure.